Alternative fuels are playing an ever-increasing role in the energy-intensive cement industry. These fuels are produced in mechanical-biological processing or industrial sorting plants. 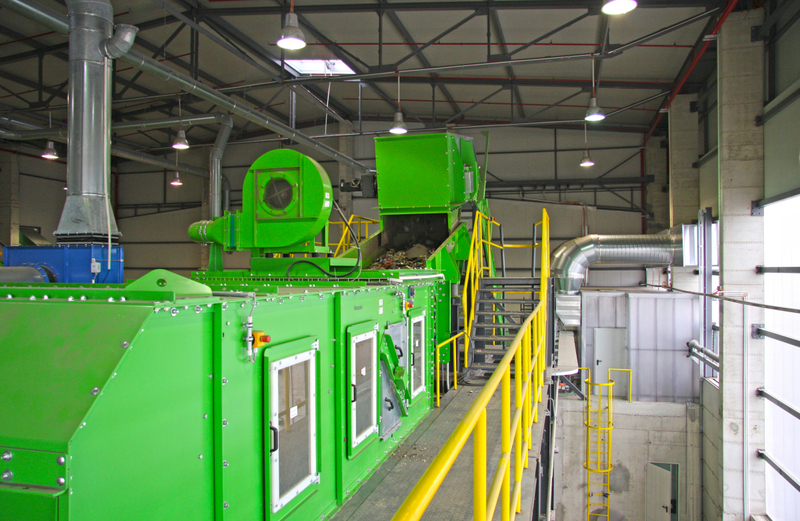 For this purpose, the Bulgarian waste recycling company, Ecoinvest Assets, has placed its trust in a completely new process line from Vecoplan. 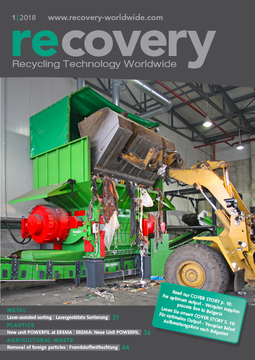 The heart of the system is the robust pre-shredding and re-shredding process for high-quality output material. Alternative fuels enable a “win-win-situation” for all concerned in the energy-intensive cement industry – cement manufacturers, local communities and the environment. This is because the use of alternative fuels not only conserves fossil fuel resources but also actively reduces CO2 contamination during production. As a result, new waste concepts are appearing in the regions surrounding the cement factories – an extremely positive side-effect. These concepts are based on waste materials from communal landfill sites along with waste from private households and comparable facilities as well as from commerce and industry. Such waste is still not used in many parts of the world. This leads to enormous amounts being stored, often in the open air and in an unorganised manner. The effects on nature and the environment are incalculable. With an appropriate concept agreed between local communities and cement factories and the right processing technology, these resources can be used to produce high-quality refuse-derived fuels (RDF). This results in new fuel supply sources, new disposal options and also improved environmental protection for local communities. Ecoinvest Assets is one of Bulgaria’s leading waste processing specialists. The solutions provider’s strategy is to implement a Green Economy. 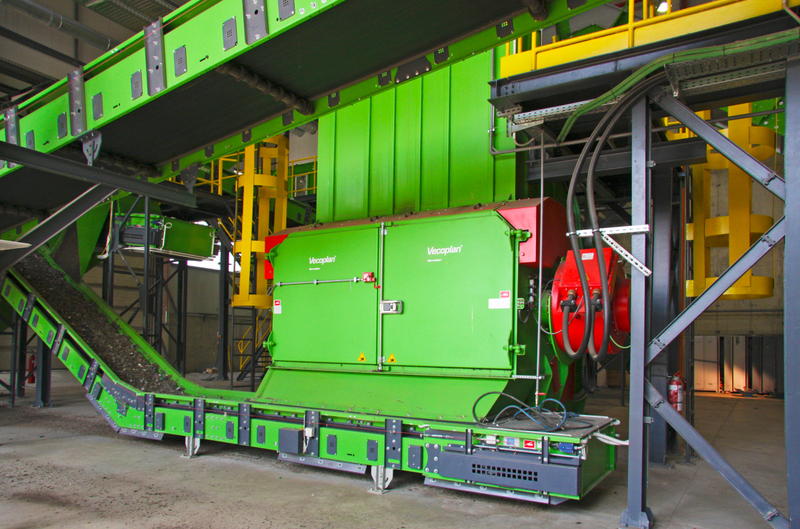 The company has set up a sustainable processing system for refuse-derived fuels (RDF) in order to position itself more firmly in this market segment. 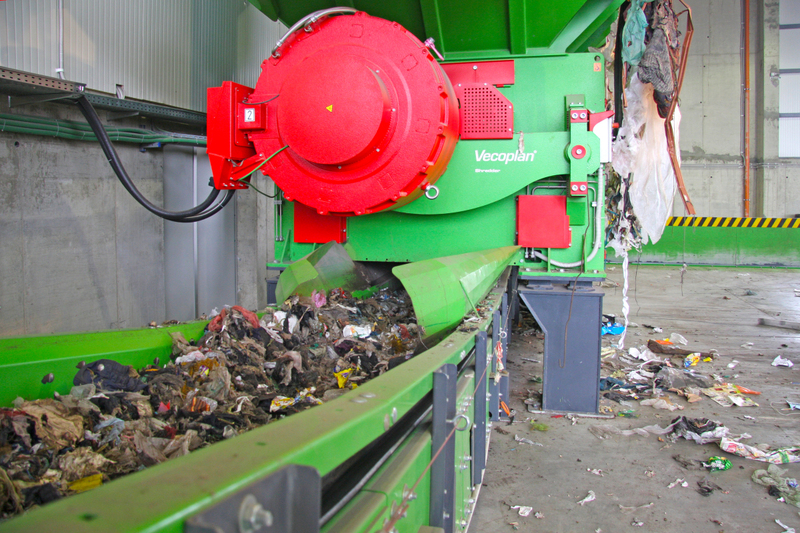 In its search for a suitable provider, the company came across recycling specialists, Vecoplan AG. Particularly impressive were the company’s extensive engineering and project experience, as well as the proven and robust components. Among other things, these include efficient shredding machines. Vecoplan AG has its headquarters in Bad Marienberg in Westerwald/Germany. 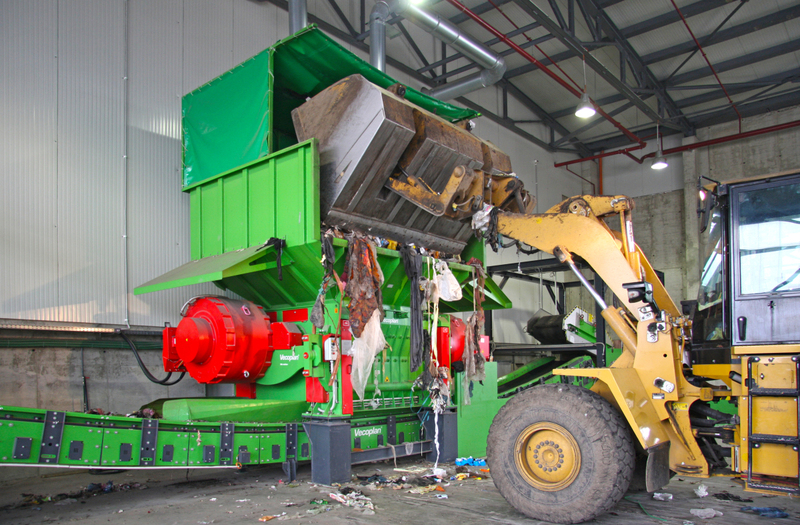 Here, the machine builder designs systems for shredding, conveying and processing wood, biomass, plastics and paper as well as domestic and commercial waste. By now, Vecoplan employs nearly 400 staff. The team’s responsibilities also include services such as overall project management and comprehensive service as well as installation, commissioning and maintenance work. In this way, customers can obtain all they need from a single source. Ecoinvest has high expectations of the equipment installed. Above all, this applies to throughput, availability, energy efficiency and output quality. A particularly efficient and modern overall system capable of safely handling sometimes very wet, inhomogeneous domestic and industrial waste was therefore required. The output material for the main burner was to be provided with optimised RDF combustion quality. Particles must be less than 30 mm and free from extraneous material. The pre-shredders and re-shredders had to be designed accordingly. 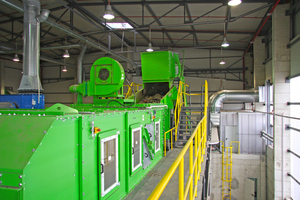 A further aspect was that the waste recycler wanted to achieve high added value and energy efficiency with the new process line for maximum overall profitability. Low maintenance and reliable service were also important factors for the systems. The Vecoplan specialists initially designed the overall system in a detailed engineering phase and carried out material tests in order to obtain the best possible results with regard to the quality of the RDF output material. 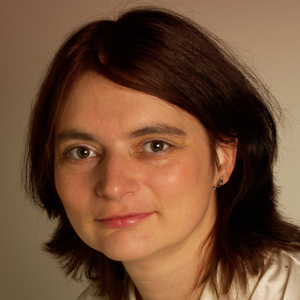 To this end, the system was designed in advance to suit the input material. The two companies jointly defined the material mix of industrial and domestic waste available in order to avoid an additional material drying process. The RDF processing provides maximum added value over the whole pre-shredding and re-shredding process as well as over the additional process stages involved in material preparation. Vecoplan has designed a highly available overall system, carried out the engineering and project management, and supplied all central system components. The company’s tasks also included the integration of local trades such as steelwork, assembly companies and electrical installation. Vecoplan also supervised the erection and carried out the commissioning. 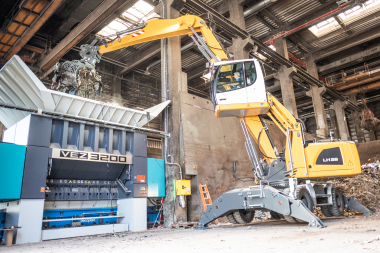 Waste material is brought into the processing hall by wheel loaders and fed into a Vecoplan VVZ 190 Taifun double-shaft shredder. The system shreds the particles to a homogeneous size of less than 250 mm. The machine is equipped with replaceable knives and counter knives to achieve consistent granularity. The two fully automatic and independent heavy-duty rotors enable quiet machine running and high torques of up to 2 x 55 000 Nm for difficult-to-shred materials. Two energy-efficient 155 kW HiTorc direct drives are fitted for this purpose. These are controlled by two 315 kW frequency converters. The synchronous drives require no mechanical elements such as belt drives, flywheels and couplings. They therefore have a very good efficiency and are also considerably less sensitive to extraneous material. In comparison with belt and hydraulic drives, they also require hardly any maintenance. 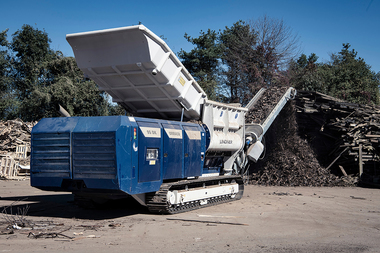 Compared with conventional drives, the operator can save 40 – 60 % in energy in the pre-shredding stage. 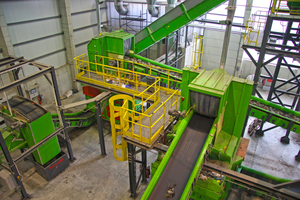 To process the material further after pre-shredding, it is distributed via a robust and reversible trough belt conveyor to two identical system sections. The conveyor belt transports the shredded waste to a type VÜB overbelt magnetic separator, which, with its powerful electromagnets, reliably removes ferrous materials. 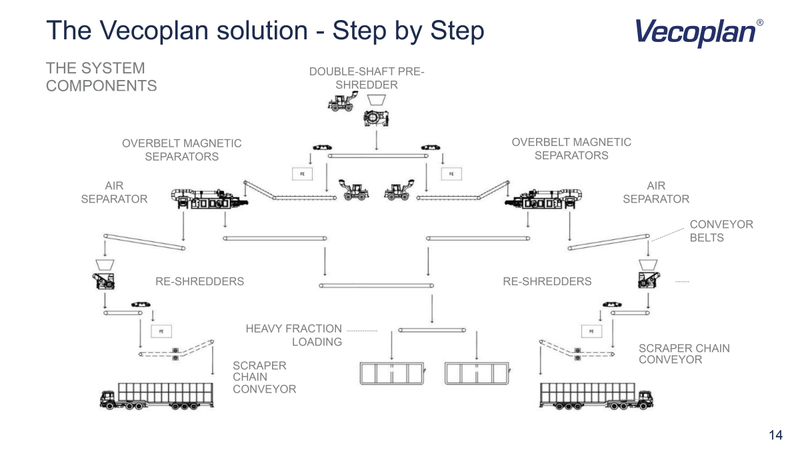 At this point, wheel loaders can feed in further pre-shredded material for both parts of the system via a chain conveyor. The materials are then transported to the next process step by means of conveyor belts. An air separator separates the material flow into heavy and light fractions. 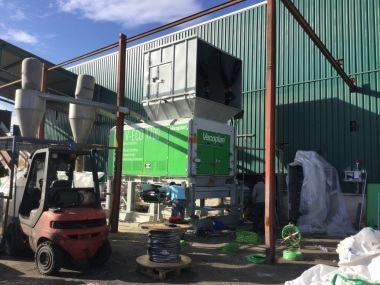 Along with the actual shredding, the air separator is an important step towards increasing the RDF quality with regard to 3D material content and inert and chlorine components. Light materials are transported at high speed into the expansion chamber by means of an air current. Here, the air speed reduces to such an extent that the light materials are deposited on an extraction belt. Items including stones, non-ferrous parts, larger pieces of wood or soles of shoes made from PVC with a high chlorine content are separated with the heavy fraction. In the air separator, heavy materials drop onto an extraction belt in front of the rotation drum. This belt transports the material to a container loading station. Here, it is carried to two containers via a further conveyor belt on a turntable. As distribution is carried out via the turntable, the user is able to change the containers without stopping the system. 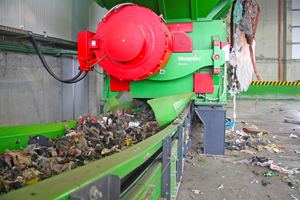 The light fraction extraction belt transports the material for re-shredding. For this purpose, Vecoplan has installed two VAZ 2500 RS F T single-shaft shredders. 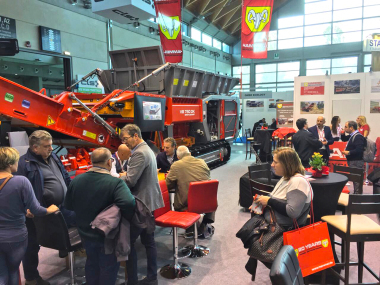 The operator is able to run the high-performance shredders at constant throughput with homogeneous output quality particularly economically. Each machine is equipped with a dynamic, fast start-up HiTorc drive. The energy-efficient motors work with a power of 247 kW, a 315 kW frequency converter, a frequency-controlled, load-dependent ram for optimum material feed – and innovative Flipper technology. Here, several compressed air springs hold the counter knife cross-bar in the working position, and laterally mounted adjusting elements ensure precise seating of the cross-bar for years to come. They thus guarantee a very small gap between the cutting tools. The sensitive overload controller responds quickly to impacts caused by extraneous material. In doing so, the counter knife cross-bar swivels downwards in order to prevent serious consequential damage to the cutting unit. With the machine at standstill, an operator can raise the pneumatic screen and lower the counter knife cross-bar at the press of a button. The open cutting unit is freely and easily accessible from the front in order to remove extraneous material and also for maintenance and inspection work. In order to achieve maximum cutting performance, the shredders in this application are equipped with 114 knives in a 60 x 60 mm format. Each knife can be used up to four times. In addition, there are multi-part, hardened counter knives which can be used twice. 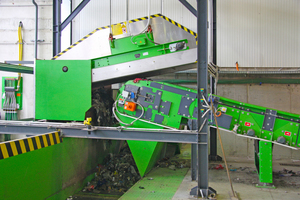 The VAZ re-shredder achieves uniform granularity thanks to the narrow cutting gap. In addition, the intelligent S7 controller automatically adjusts to the input material and thus achieves optimum shredding. Each machine processes around 7 t of material per hour to produce a uniform particle size of less than 30 mm. Running for 16 hours a day in two-shift operation, they shred at least 50 000 t of material per year. 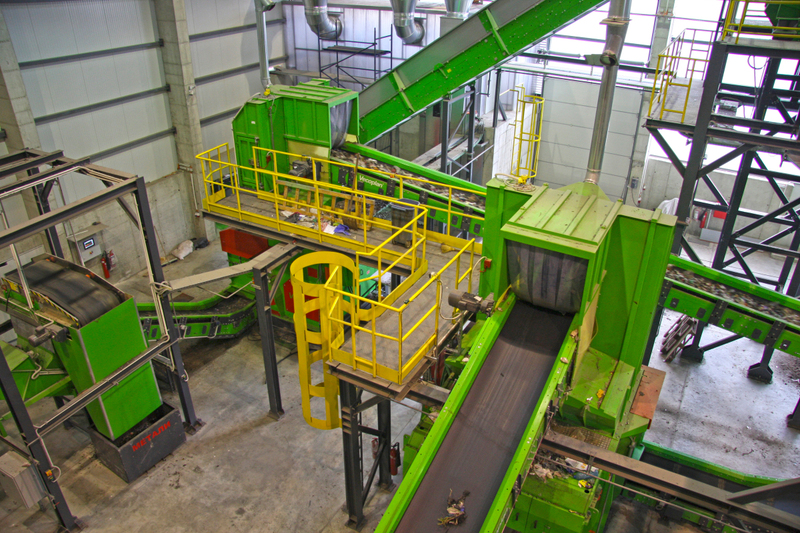 After re-shredding, conveyor belts transport the RDF to powerful overbelt magnets, which extract further iron from the material. 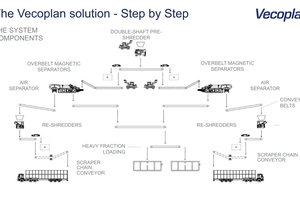 Closed drag chain conveyors then transport it to an open store. Here, wheel loaders take the RDF and push it onto the lorries’ loading surfaces. 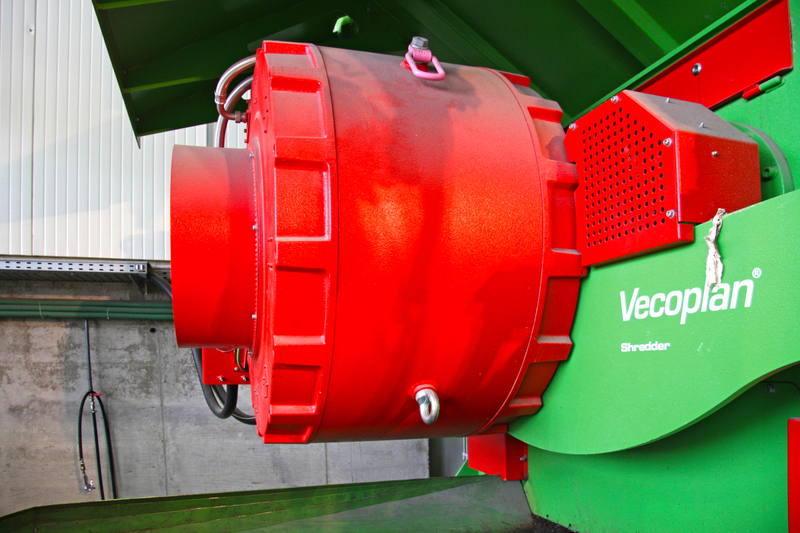 Vecoplan has implemented an overall system which produces high-quality alternative fuels with minimal operating costs. All components of the system are matched to one another. As a result, the robust technology achieves high availability and can handle foreign materials safely. With the successful implementation of this project, Ecoinvest is now able to boast a groundbreaking processing system for the whole Eastern European area. The system has been running continuously and reliably ever since it was commissioned. Vecoplan provides support for all service and maintenance work with its Live Service programme. With this online tool, specialists are actively available at any time – whether by chat, online conferencing or direct access to the system. Even though the cost of primary fuels is currently at a low level, alternative fuels prepared from waste materials will become increasingly important for the cement industry in the long term. This is because, against the background of CO2 reduction targets and energy change, the energy-efficient use of these fuels makes a significant contribution towards reducing the use of fossil energy sources. Cement works operators can therefore save costs in the long term and make a valuable contribution to environmental protection.